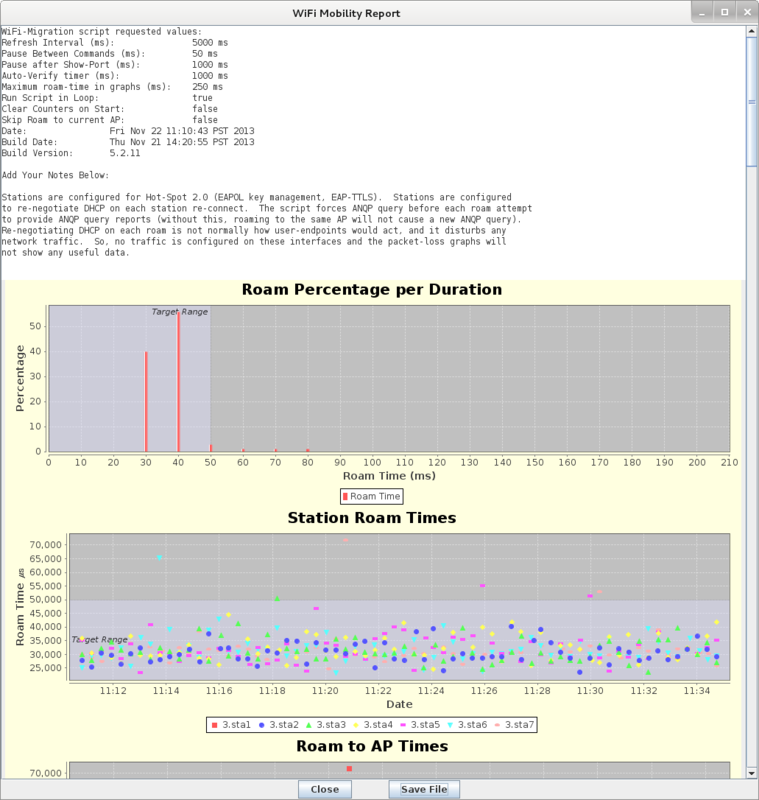 Goal: Use automated script to reconnect stations to an AP and report results. Requires LANforge 5.2.11 or later. Configure Stations to use HotSpot 2.0 (802.1x, 802.1u, etc) and associate them with a HotSpot 2.0 AP. Use the 'WiFi Mobility' LANforge-GUI Plugin to automate re-connecting to the AP and querying ANQP. The plugin will create graphs and other reports that can be saved to HTML. This example uses a LANforge CT520 system but the procedure should work on all CT521, CT522, CT523, CT525 and similar systems. The AP in this test is another LANforge machine, but it could be any AP that supports HotSpot 2.0. 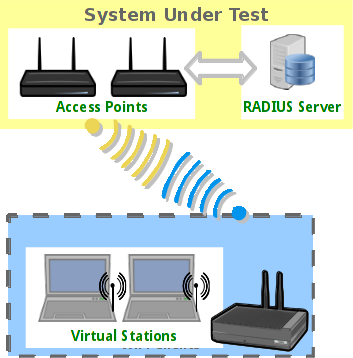 A similar test could roam between multiple APs. If the APs are all on the same channel there are no restrictions, but if the APs are on different channels, then only a single station can be configured per LANforge radio. In that case, multiple 3-radio CT523 or other high-density systems may be a good choice. Configure stations to connect to an AP configured for HotSpot 2.0. Go to the Port Manager tab, select wiphy0 on proper resource, click Create, fill out appropriate information and create desired number of Station interfaces. Once the single station is connecting properly, use Batch-Modify to configure the rest of the stations to match the first. Start the WiFi Migration script. Go to the Port Manager tab, select the stations you wish to roam, right-click and choose the WiFi Mobility menu option. The options at the top default to common values and most do not need to be changed. For this example, you must unselect Skip Roam to current AP because the script is requesting exactly that. The ports will be automatically configured based on the selection on the Port Manager tab, and may be adjusted before starting the script. The Ports in Use should normally include all stations used in the script. The configuration requiring the most work from the user is the roaming script itself. There is a help section on the left, and a script-entry field on the right. Once the script is written, it should be saved in a text file on the user's PC so that it can easily be pasted into future WiFi Mobility scripts. Some key points are that you must scan about 1 second before roaming or the roam logic in the supplicant process will either fail or do its own roaming. Either way, the results may be worse than if you do the roam properly in the script. It can take a bit of time for LANforge to get all of the data it needs to report on the roam attempt, so it is suggested that stations not roam more often that about once every 10-20 seconds. If reporting is less important, then the stations can roam more often. Once the script is properly configured, click Start to start the roaming. A window will pop up that has live-updating graphs of various reports. 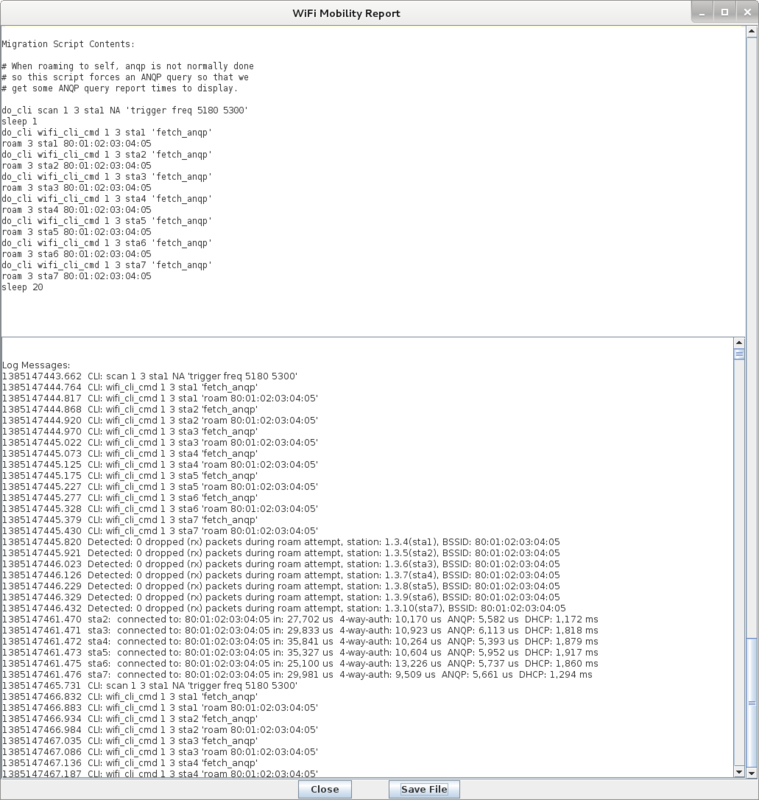 A text log is at the bottom for more detailed analysis, and the whole thing can be saved as HTML. The graphs can be scaled and configured through right-click menus if desired. It will take 1-2 complete roam attempts before the graphs are able to show any useful information. 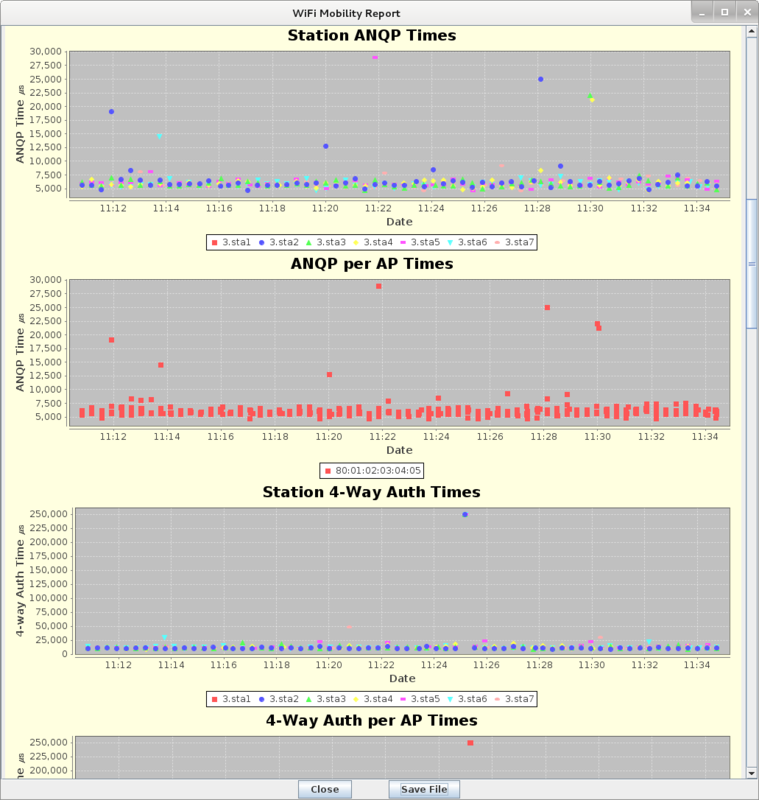 ANQP and 4-Way Authentication graphs. 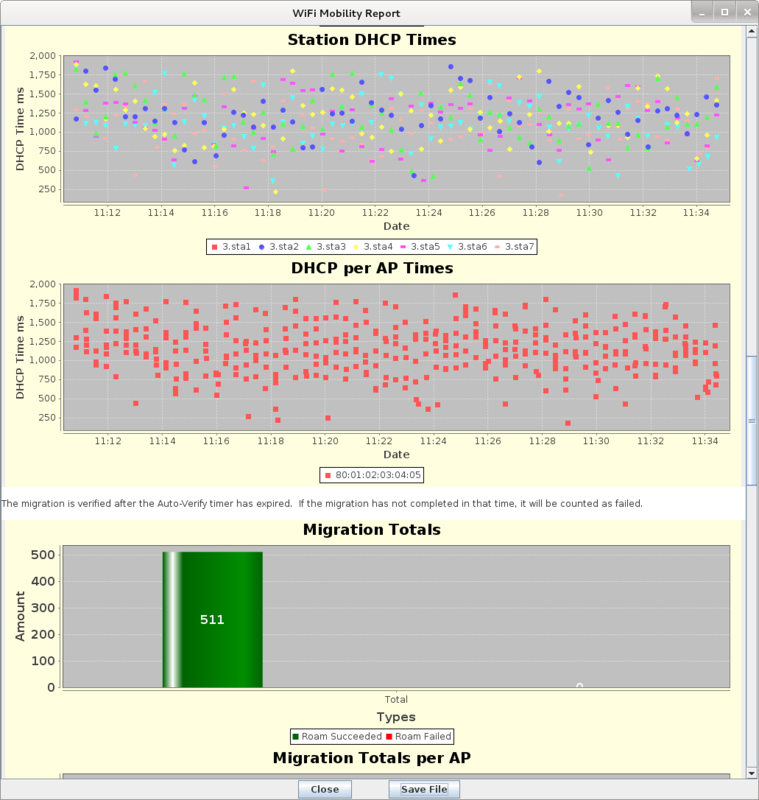 DHCP Negotiation and Migration Totals graphs. Text log with timestamps. Can be coorelated with wpa_supplicant logs and other log files to debug specific roam attempts.